EMPTY MICHIGAN STADIUM UofM empty Michigan Stadium photo picture print photograph for sale. This EMPTY UofM MICHGAN STADIUM photo picture print was made from nine separate bracketed photographic exposures. It is a wonderful up to date artistic portrait of the 'new' Michigan Stadium in Ann Arbor taken in the Fall of 2012. In the distance can be seen a colorful trees outside the Michigan Stadium with dramatic skies overhead. See the other photos on my website showing another photo from this similar wide angle with a crowd of over 111,000 fans. 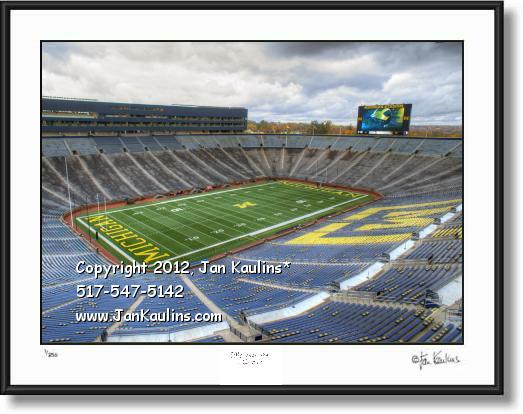 ANN ARBOR UofM Stadium PHOTO ART PRINT PHOTOGRAPH FOR SALE. Ann Arbor MI photo photography art prints photos for sale by artist photographer Mr. Jan Kaulins. These are original High Dynamic Range (HDR) color photographs created by nationally recognized award winning artist/photographer Jan Kaulins. These MICHIGAN STADIUM photos are the newest artistic images in his most recent series of photography. Each photograph has BEEN CREATED FROM NINE SEPARATE BRACKETED DIGITAL EXPOSURES and then layered together into one photographic image. It is then ‘tone-mapped’ where individual areas of the photo, as well as contrast, saturation and other qualities of the image can be artistically manipulated to bring out the artistic effects that make these photos so visually unique and striking. Some of the photos in this series are even further digitally enhanced for artistic effect giving them an almost painterly or graphic silkscreened look. They do not look like your grandmothers traditional photos. These photos are however not hand-colored, like Jan’s other photographic series shown on this website. This is an entirely new process is being used.